These classes are open to the community! We currently have classes at the Daystar Center! No class near you...our private tutoring class option! the classes. If you don't see your school listed but would like to get a program set up, contact ana@langochicago.com for details. If there are no community classes or on-site classes near you, Lango will bring a teacher to you. Check out our Private Classes tab for more info! Children in this class don't sit still for long! 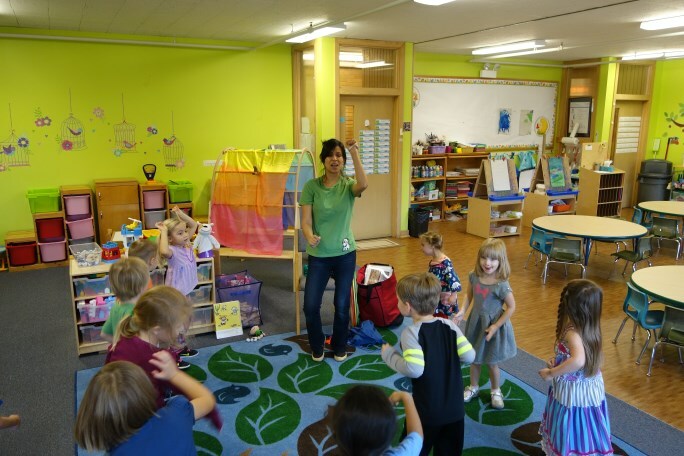 Accompanied by parents or caregivers, these young "students" (ages 1 1/2 to 3 years) start learning a new language through a variety of activities designed to engage their minds and bodies. Students become great friends with Cosmo the Bulldog, participating in his crazy adventures right alongside him and his friends, the Lango Kids. Music and movement form the foundation for the classes, as the children sing simple, rhythmic songs and dance, run, spin and jump around the room! Meanwhile, our teachers work with the accompanying adults, teaching them age-appropriate games and activities so that they can reinforce learning at home. These "play classes" are great for parents and caregivers who want to learn a new language alongside their children!